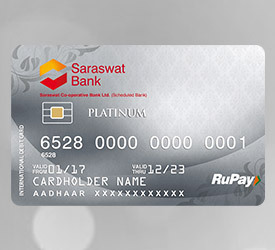 RuPay Platinum International Debit Card - Saraswat Cooperative Bank Ltd.
Saraswat bank RuPay Platinum International Debit Card is designed specially to provide you with host of premium services. This card can be used at ATM and Merchants across the world. Your RuPay Platinum Debit card can also be used for online shopping and making digital payments in India and abroad.